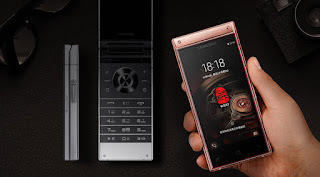 As a follow up to the last year’s W2018, the South Korean giant Samsung has launched the ultra-premium W2019 flip phone which comes with not one, but two AMOLED screens, you can use it without opening it. And when folded the device is seen with the number dial pad and hardware navigation keys. The new ultra-premium Samsung W2019 flip phone sports some modern and powerful hardware including the dual rear cameras, two displays, a Snapdragon 845, and other flagship specs. Coming to design, the device is . Clad in aluminum with a unique-looking hinge. There is glass display on the front, back, and inside. The back panel is supported by the Corning Gorilla Glass while on the sides, there are a fingerprint reader and Bixby button. On the front the device sports a 4.2-inch Super AMOLED display with 1,920 x 1,080 resolution, though there is no headphone jack and Flip the W2019 to witness a second 4.2-inch Super AMOLED display with the same Full HD resolution, a directional pad, and a numeric keypad.